I have a feeling I know what you're thinking. You're wondering "what in the world is a West Coast girl doing knitting a pair of thrummed mittens in January? Especially when barely a snowflake as even landed on her doorstep all winter long?". Or better yet, why would a West Coast girl want to a pair of thrummed mittens? It doesn't even get that cold enough around here to fully appreciate the pure warmth that thrummed mittens promise to have. Yes, the cold here is a chilly one that nips right into your bones but it's nothing like East Coast cold. Over there it gets down to the minus digits. My answer: This winter, when am I not cold? Cause yeah, I'm always cold. Especially first thing in the morning when I'm driving the Munchkin to preschool, and on the nights when I go to knit night - when I'm forced to leave the warm comforts of the cafe and shoved into the freezing arms of Hades. I'm so cold that it takes me a few tries to steady my shivering hand long enough to start my truck. And of course the drive home isn't long enough for the truck to warm up properly so you bet my teeth are chattering all the way home. Back in November thrummed mittens had made my November Obsessions list but sadly I knew that there was no way I was going to get around to knitting a pair up until after the December holiday crafting madness ended. I made myself promise that no new projects were allowed to be cast on in the new year until I finished a few WIPs first - with the exception of the thrummed mittens. Only because I knew I needed them (hush! I heard a few of you laugh!). So the second I had bound off the last stitches of a few projects that needed my immediate attention, I had cast on the first mitten. Even though the ribbing had knit up lightning quick, I have to admit that the rest of the knitting is a little slow going. The thrums can be a little fiddly and in general the bulkiness of the project makes it a little awkward. But the main thing that's keeping me from knitting with my usual speed: the making of the thrums. Right from the get-go I was a little hesitant to dive into my braid of roving and make the thrums. It can be quite the intimidating task when you have no idea what you're doing. I'm sure knitters who spin would've had a much, much easier time with this but I for one really was unsure if what I was doing was right. 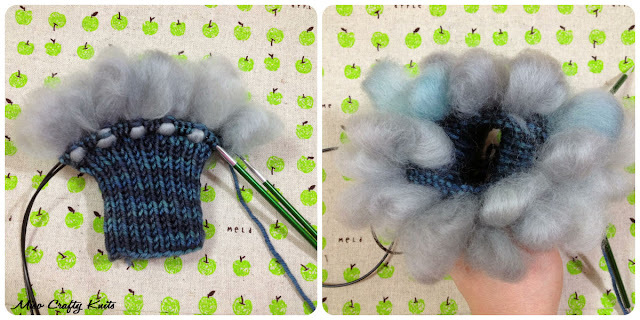 I watched a few Youtube videos, checked out Hello Yarn's tutorial (and stared in awe of all the thrummed mittens she has knit), and scoured the Yarn Harlot's blog for tips (she has an entire post dedicated to thrum questions) since she also has quite the love for thrummed mittens. Finally I decided there was only one thing to do to get over my fear of making thrums: To just do it. I only made a few at first to get the feel of the roving and on how to make a thrum. Can I just say I got overly giddy when I had knit my first row of thrums! I'm such a geek, but it's true. I think I took a zillion photos. I definitely Instagram'ed it. Actually, all the photos in this post are from my Instagram account. It's definitely a nice way to document my progress in making these bad boys. I'm so glad that I had only made a handful of thrums at the beginning. From the start I had the fear of making my thrums too big (although I've read that there really is no such thing!) and that I would run out of roving before I finished the mitten. Well, lo and behold, a few inches into the mitt I realized that my little braid of roving was shrinking faster than I can knit. I had to stop and divvy up the thrums that I had already made into two. I was having a heck of a time trying to pull apart my roving too but lucky for me when my friend Liisa was here a little over a week ago, she pointed out that BFL is a longer stapled wool (meaning the individual fibres are much longer) and therefore I needed to keep my hands further apart when I pull off a chunk of fibre. Good to know. After that pulling apart my roving was much easier. So as we speak I'm still knitting the first mitten. I know, what a slow poke I am! My household and I was sick for most of last week with that super flu that's been going around and I didn't get to knit as much as I thought I would. Instead, I spent more time sleeping and trying to decongest than knitting. Every time I picked up my needles I would knit a few stitches before trading in the sticks for a box of tissue. I'm hoping to finish at least one mitten before the week is over. And now that I know what I'm doing thrums-wise, I think I'll be a little faster in making the second one. I have a feeling this mitten mate is going to be much nicer looking too. I've always been interested in making a pair, but never get around to it. It's one of my 2013 knitting goals now. That I just made right now, haha. Thanks for those helpful links! You're going to love them! I've worn mine almost every day in St John's, and they're delightful. Cozy warm, even when it's -14 with the windchill here (gah!). Can't wait to see the finished mittens! I was wondering when we would get to read about your thrummed mittens! I saw a shot of them a while back and was even stalking your project page! Quick question, I checked out both of the links in your post, and HelloYarn's technique seems slightly different from YarnHarlot's technique. Which one are you using? As for the links, I tried out the Yarn Harlot's way (knitting both the thrum and stitch through the back loop) and I'm not sure if she's putting the thrum first or what, but I've been finding that the thrum doesn't look so great and only one side of it shows properly. So I switched to the Hello Yarn way (knitting the thrum and stitch as one, as you normally would knit the stitch) and it was perfect. So I think I'm going to stick to that method!